Demonstrated a cell-free colorimetric system based on Glucose Oxidase (GOx) as a pilot experiment and proof of concept. Codon optimised and synthesised the codon optimised version of the AOx gene from Pichia pastoris to be used in Escherichia coli. Successfully assembled AOx into a protein expression vector (pET28b). Successfully demonstrated the expression of the AOx protein after induction of expression vector. Successfully submitted and registered AOx part to iGEM HQ in pSB1C3 backbone (BBa_K2092000). Methylotrophic yeasts are able to utilize primary alcohols as a sole source of energy and carbon . This involves the function of specific enzymes called alcohol oxidases. 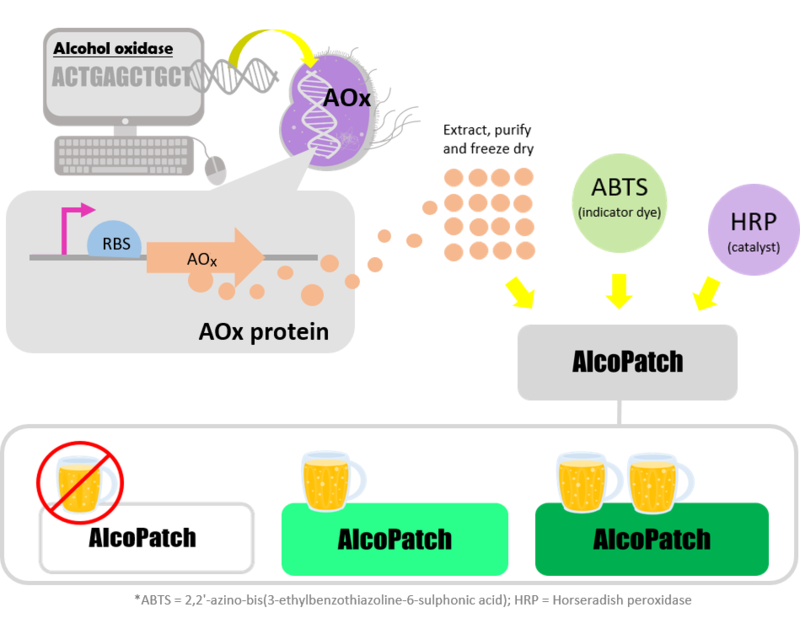 AOx (AOX; alcohol:O2 oxidoreductase, EC 1.1.3.13) is implicated in the methanol oxidation pathway in yeasts, although it can also oxidise other short-chain alcohols, such as ethanol . Based on this system we have introduced a plasmid expressing recombinant AOx1 from Pichia pastoris into Escherichia coli BL21 (DE3) strain. This will then be used in a cell-free colorimetric system. AOx is hence a new BioBrick we have characterised (BBa_K2092000). This cell-free system is achieved without the use of living cells. Instead, all components needed to catalyse the alcohols are provided in solution for their use in vitro. Our mechanism consists of two catalytic reaction steps. Firstly, in the presence of oxygen, ethanol is oxidised by AOx to acetaldehyde (ethanal), producing hydrogen peroxide (H2O2) as a detectable by-product. 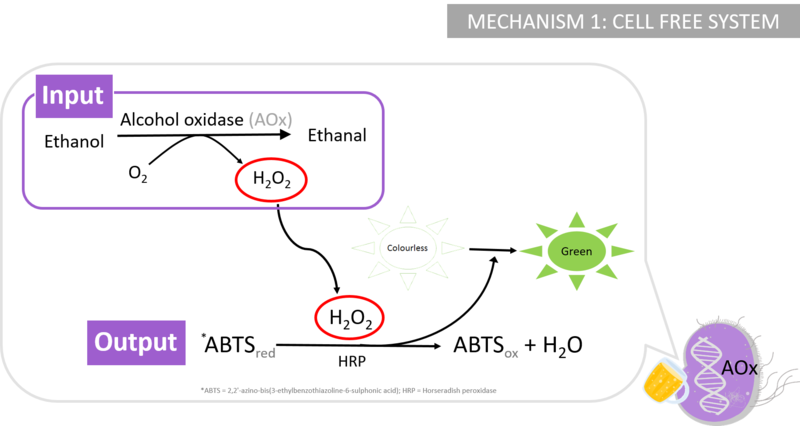 In the second step, H2O2 is then used by horseradish peroxidase (HRP) as a redox substrate to oxidise different chromagens and generate a colour change, where (2,2'-azino-bis(3-ethylbenzothiazoline-6-sulphonic acid) (ABTS) is the most sensitive one , changing from colourless to green. Different concentrations of ethanol will produce different concentrations of H2O2 in the first step of the total reaction. HRP will oxidise ABTS according to the varying amounts of H2O2 produced and therefore oxidising more or less dye. This will result in a gradient of colour intensity correlated to the amount of ethanol.